rachelrmf, this is a good question, and one that is continually evolving based on what is observed and coming to be known in terms of what constitutes a robust diet for crabs. I am going to provide a breakdown of the specific food groups and what they are generally good for. Note that I will not have included ALL the foods in the category, and some categories overlap in one or 2 areas too. I try to offer daily a food from each group. I used to also leave home made dry kibble, worrying that they do not all eat at the same time or each thing (which they don’t) but I have a lot of crabs, and I have learned for my herds, the general proportions to offer. I have stopped leaving dry goods in at all times, and find that their foraging is better, and I waste less food! I still feed them dry goods daily, just minimally, and I usually sprinkle it on something that it will stick to like juicy fruit or vegetables. This is something I do because I have tested and offered these foods to the crabs in trial alone before! Scientists evaluate that crabs use a natural selection imprint to prevent themselves from eating only one type of food source and thus harm themselves with not getting all food resources needed. They are also imprinted to ignore foods that have been smelled or eaten within a 9 -14 hour period of time, and one of the reasons relying on commercial foods is so dismally inadequate. They are not of the type of animal that relies only on one type ofr food like protein, or vegetation or calcium, etc. They must have a robust combination of all of them! Many of the foods must support their ability to metabolize to their environment (heat, humidity, light, growth) and they require a balance of ALL these types of food resources (some more at specific times like pre-molt, or PPS) in order to thrive. tannin rich leaves, bark, cambium (inner branch skins) of plants like oak, maple, mangrove root, some perennial leaves; fresh fruits and vegetables that are orange, yellow, red or dark green (i.e. squash, sweet potatoes, carrots, natural corn, mango, blue berries, etc); many flower petals (dry), spinach, foliage, bean sprouts, seaweed: spirulina in particular, reptile moss (from pet store) etc. grapes, apple, honey, wheat germ, oatmeal, dried fruit (raisins mostly due to Copper sulfate use in others), banana, pineapple, citrus pulp (inner membrane of skin considered cellulose). Omega fats: this food group is very important and is totally missed in commercial food formulations unless they are frozen foods! These are necessary for nervous system, exo-skeletal health and processing of carotenoids and other minerals. If there are deficiencies in this group it is typically exhibited by molt death (where you are uncertain), a mildewy appearance to the exoskeleton (they look dehydrated), and they are not active! Foods in this group overlap proteinous groups. Coconut, walnut, whole fish (like a dead gold fish), fish skin, animal fat, olive oil, some grass seeds, seeds, peanut butter, etc. There is a mirade of these suitable, some found in fresh flower petals like roses, sunflower, crab apple blossom, etc. Take a look at the edible plants list at Epicurean Hermit! Calcium: it is considered superior to provide more than one natural form of calcium! Calcium of course is used mainly for growth of the exoskeleton. Calcium without the support of light and carotenoids will not be properly absorbed by the crab! The acceptable form for supplementation outside of natural forms is Calcium carbonate powder ONLY! Foods containing calcium, will also provide some proteins as well. freeze dried brine shrimp, meal worms, blood worms, krill (fresh, frozen or freeze dried), shrimp tails, sand dollars, powdered oyster shell, cuttle bone, broccoli heads, milk. Steam all shell fish prior to offering to hermit crabs! 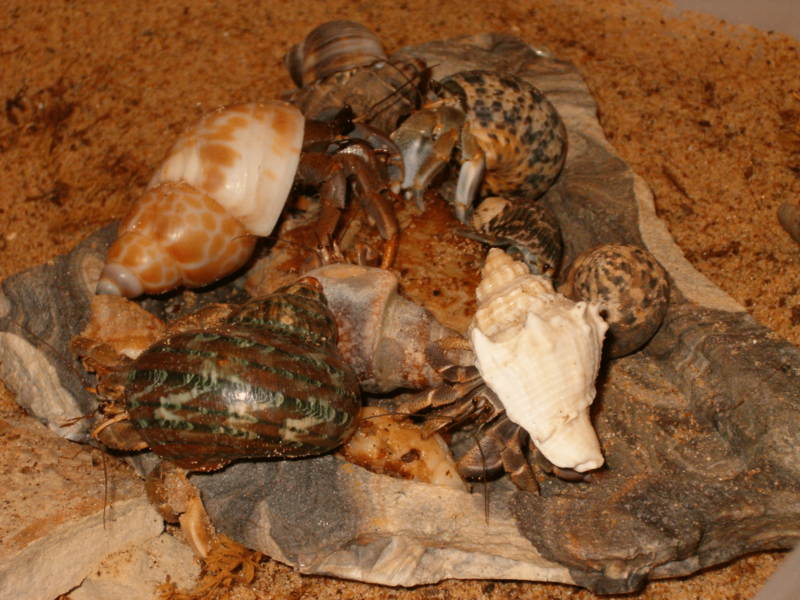 Previous Post: FAQ Are gold/feeder fish safe to feed hermit crabs? Next Post: FAQ What is molting?